Animals are often closely associated with gladiatorial combat, but in reality the spectacle of animals in the amphitheatres was actually a completely separate piece of entertainment. Often thought to be gladiator battles, but it was only when man faced man that it was truly technically a gladiator battle. 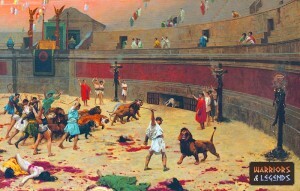 When animals were in the arena, it was typically one of two pieces of entertainment involving the venators and the bestarii. Both these spectacles were another form of entertainment in ancient Rome and involved animals from lions and tigers, to hyenas and even reportedly rhinos. In many big events these battles with animals were just as intriguing entertainment as the gladiator battles, and it was common for emperors to put on lavish and outlandish events, often involving hundreds of animals. To fully explore the use of animals in as part of the games and entertainment in Rome its easiest to look at the various types of entertainment that the Romans put on involving animals. The bestiarii animal trainers remove the animals from the amphitheater after a performance. If a new rare animal was found, captured and broght back to Rome, it was often first shown in the ampitheatre. For example the first giraffe to be seen in Rome was first exhibited at the ampitheatres. These animals were typically shown to the public 24 hours before they were involved in an event, but not all animals would be put into a combat or fight situation. Venatores were actually animal hunters and experts, trained and skilled in combat against animals. These warriors while not typically considered gladiators were no less brave, having chosen to face off against a myriad of dangerous wild animals with the ability to maim and kill a human with ease. These types of competition were very popular and while not technically gladiator battles were commonplace in big events at amphitheatres in the Roman empire. The term bestaraii is actually unclear in Roman terms, with two separate meanings seeming to be prevalent. The first was that bestaraii were not really fighters or animal experts but simply criminals or war prisoners who were essentially forced to fight against various animals. It was thought that many bestaraii might be released into the arena at the same time as a number of other animals, often with very little chance of survival. There is in fact one case where its thought that one lion killed around 200 bestaraii in one session, showing how this was more a punishment or piece of unfair entertainment that a true competition. The second meaning is that bestaraii were actually the animal handlers of the amphitheatres, rather than the victims of them. Its likely that both these meanings were actually in use. 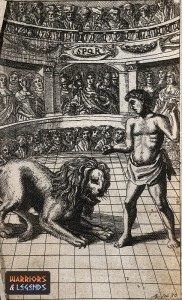 A venatore gladiator facing off against a lion. In ancient Rome, not every animal was equal, for example the more ferocious or dangerous animals were often typically the most revered by the ancient Romans. The lion was one such animal that really got the anticipation of the Roman high. Lions are typically very territorial beasts and show great ferocity in the face of a fight and for this reason they were loved. The vivarium was the Roman equivelent of an animal keep, almost like a zoo in Roman times. It was here that the animals would be put on display 24 hours before an event, allowing the roman public to wet their appetitie for the next days event. what Animals did they use in the Colosseum and amphitheatres? What animals did they use in ancient Rome and the Colosseum i hear you ask. Well it’s a very good question, but also very hard to answer! There are many examples of animals listed to have been used, but in many cases its quite hard to find concrete evidence. Therefore the easiest way to display in the information is to list all the purported animals that were used and where evidence is available we can also provide that too. One interesting thing to note is during the construction or even the planning of the Colosseum in Rome, there were actually custom solutions build for the animal games. Special lifts and areas were built specifically to hold the animals before they were released into the arena. *add more about the custom solutions in the Colosseum. It’s planning like this, that shows that these animal games were big business back in Roman times, with the emperors and Roman citizens obviously showing an affinity to these battles enough that custom build solutions were devised for the Colosseum. Pitting animals against man might now seem like a rather cruel form of torture or competition, but back in ancient Roman times it was more a way of life. To eat meat, the Romans would need to hunt or farm animals and life was much harder back then. These battles in the amphitheatres would have significance within the Roman society, linking back to the Roman citizens how they survived, and ate. In many ways this was an example of how man can overcome anything rather than the merciless killing of animals. The animals involved in these games had a fair chance at winning in the competition, for example, for a lion or tiger to face off against a man would have been a competition that had the potential to be very close. So while in the initial observation these games might seem cruel and twisted in reality they might have had some significance in Roman times, even though it is a waste of life in one form or another.